Today is my last weekday as a SAHM. Come Monday, I will be going back to work. It is a bittersweet day for me. I spent my late morning entertaining her while she playfully kept crawling over and tugging on my top. Then I hit the gym. Last chance to go during off peak hours. Later in the afternoon, we went to Orchard to shop. On my way to gym, I actually felt so many different emotions all at once. This is it. 329 Days spent with my baby, and this chapter has come to an end. I am relieved – that all the minor issues detected at birth has been sorted out quickly. 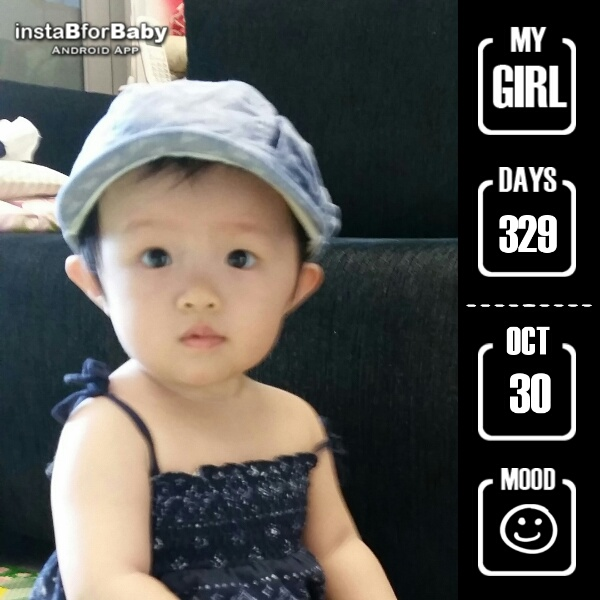 I am so proud of her – growing from 2.645kg to 8.6kg, and all the many milestones achieved in this nearly 11 months. I am blessed – that I was able to have a chance to participate so intimately and almost 24/7 in this whole period. I am sad, it’s breaking my heart, that this has to end. 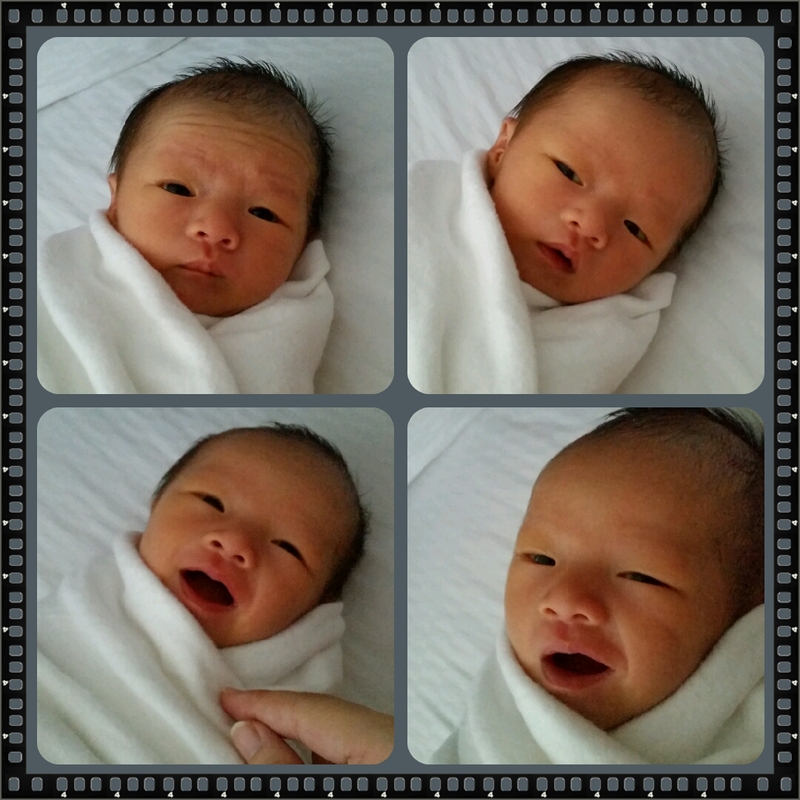 Little Foot, please jiayou for Mummy. Going back to work is necessary, for you and for me, as I find my footing again in what I think I do best. Your naive mama continues to think that in her own little ways, she can make a difference to Singapore. You have defined me as a mother over this whole period. Some days, I feel you are the teacher as I keep learning and relearning. You redefined life and its significance in a way I could never have understood before. I wouldn’t have had it any other way. I hope our bond will always be strong. Thank you for being here and growing well. I will always look back on this time spent together and replay all the little pockets of memories we’ve built in my head whenever things get hard or my breath gets short. Remember, no matter what happens and how many years may have passed, mama loves you so much, and I always will. Thank you for making this a home full of memories, thank you for coming into this world and being my daughter. You were all we hoped for and more. And even your cries. All a part of our fond memories. I will miss this 329 days and will look back fondly…. so many memories imprinted in my mind. Please continue to give me your biggest grin whenever I open the front door. I am sure it will wash my stresses and pains away. And … yes. It’s a wrap to my SAHM life. I hope you forget tonight, a night where you cried big tears as you resisted sleep. A night where you refused to latch, and tried to struggle out of the carrier. A night when Mummy said hurtful things to you in desperate exasperation as nothing worked and you just kept crying and throwing a tantrum. Every day with you should be a blessing, even on such days. Yet there are times when I can’t help but ask God why he took my health away from me. In exchange I got you ….and loss of sleep … and loss of freedom and my old life. Forgive me for the harsh words that spewed out. I don’t love you lesser on these days. It’s just Mummy is bring a brat and still adapting to our life. And next week, we both will have to adapt again as my work comes back into the equation. 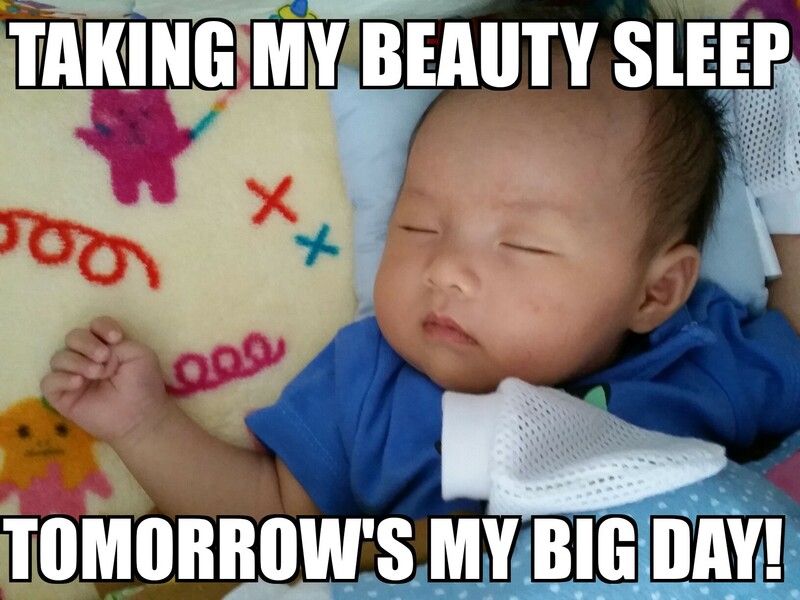 Good night my baby…. please don’t resist sleep too often. I’m sorry that I fail you on days like this. After a night’s rest, and some reflection, we seem to have put last night behind us…. In this whole trying situation, Daddy also got a tongue lashing from me. 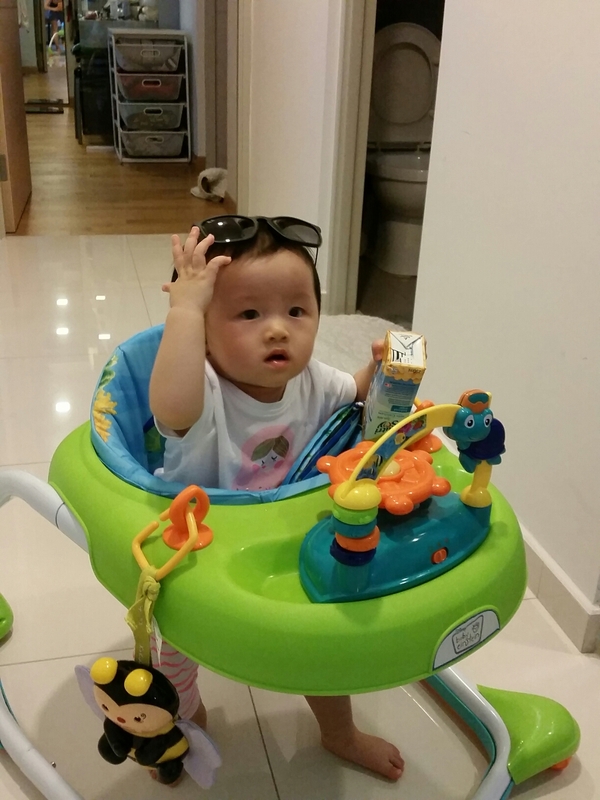 I guess it’s every mummy’s dilemma – I need help, yet don’t know where I need the help, so we leave the daddy helpless and waiting to be scolded. There are bad nights, there are good. One article popped up on my Facebook feed – don’t let your child’s behaviour drive you crazy. Look beyond the behaviour and ask yourself what your child needs in a situation. 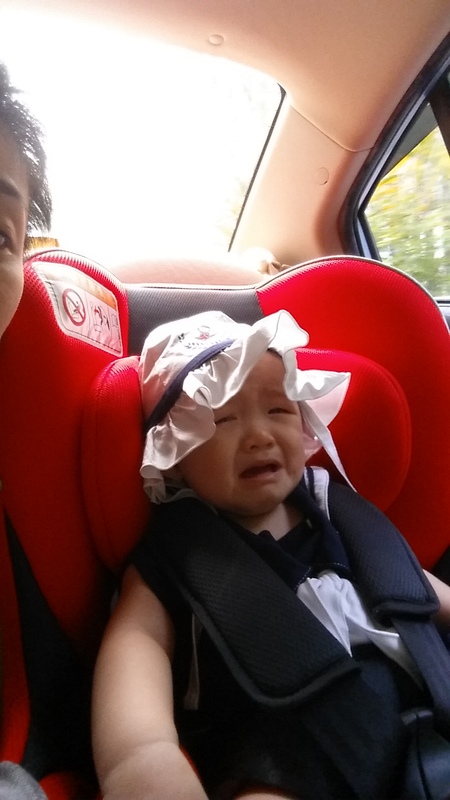 My knee-jerk tantrums together with her crankiness really didn’t help the situation. 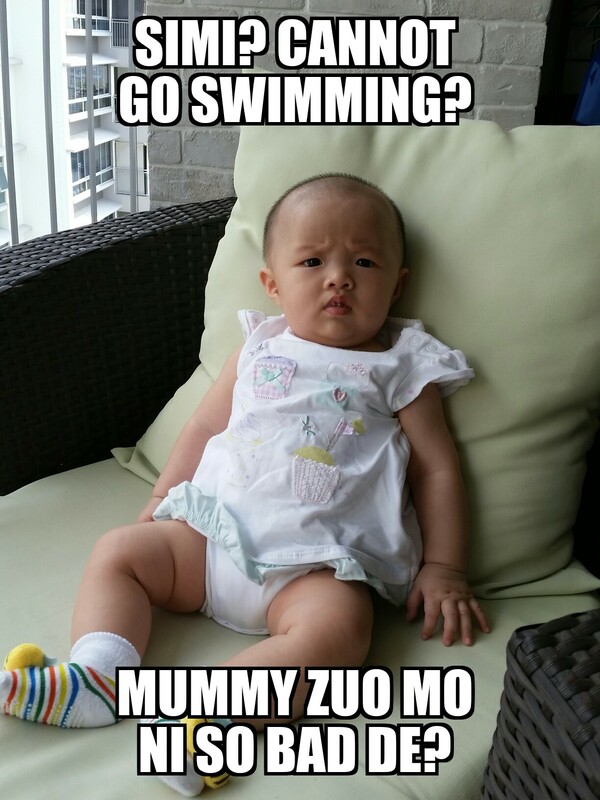 Sighh… motherhood, there is still so much to learn. Next time, I will try to be much better. 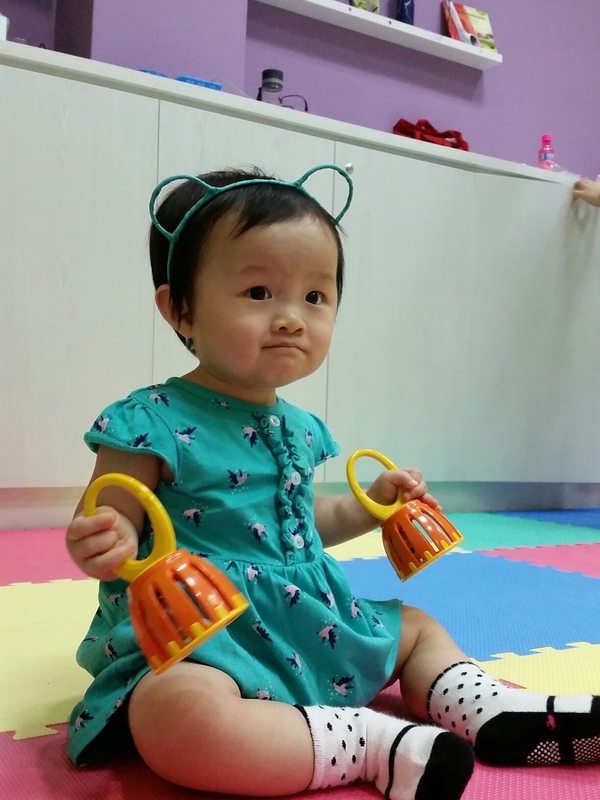 Since 3.5 mths old, we have been bringing Little Foot for music classes every Sunday, and it was only last Sunday that we realised that unknowingly, babies have come and gone in the programme, but we have continued till now, and are in our fourth term with the school, Musikal Genesis. 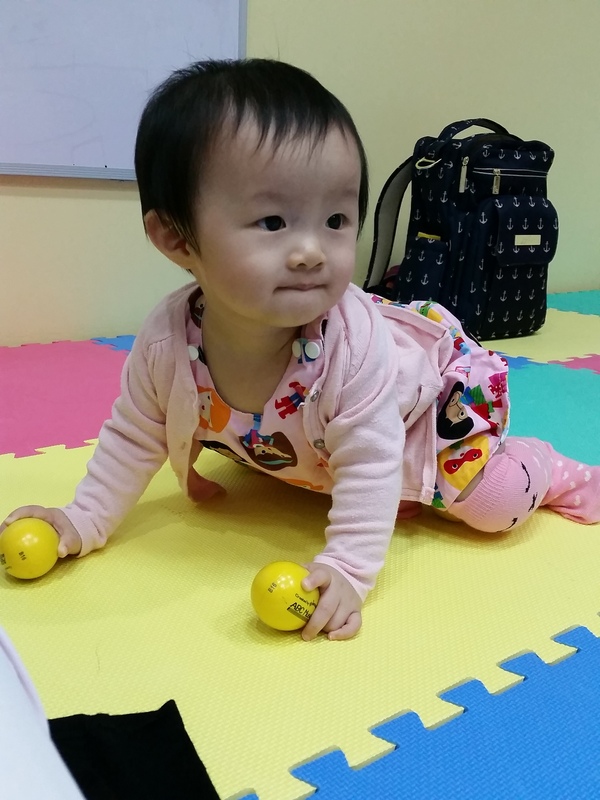 Like many first-time parents, and having taken extended leave, I started out with an eagerness to bring her to try out classes and activities that will help in her development, with the caveat that we will only do what does not make her feel burdened/stressed. 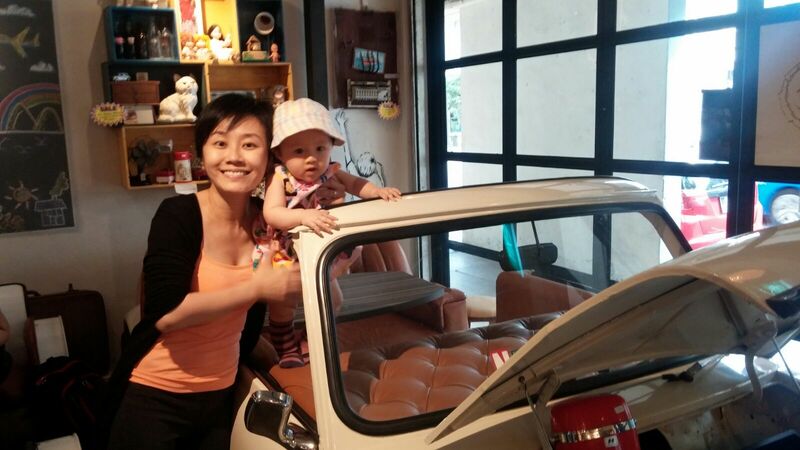 We settled for Musikal Genesis after trying another well-known music school at Tanglin Mall. Between the two trials I did, I decided on Musikal Genesis because a) we didn’t feel out of place, unlike at the other school where it was all expat wives and their babies, b) being along Balestier, it was more accessible to us, while I had the trauma of having to hike to a bus stop because there was a long queue for taxis at Tanglin Mall, and c) most importantly, this teacher knew what she was doing and Little Foot took to her almost immediately! 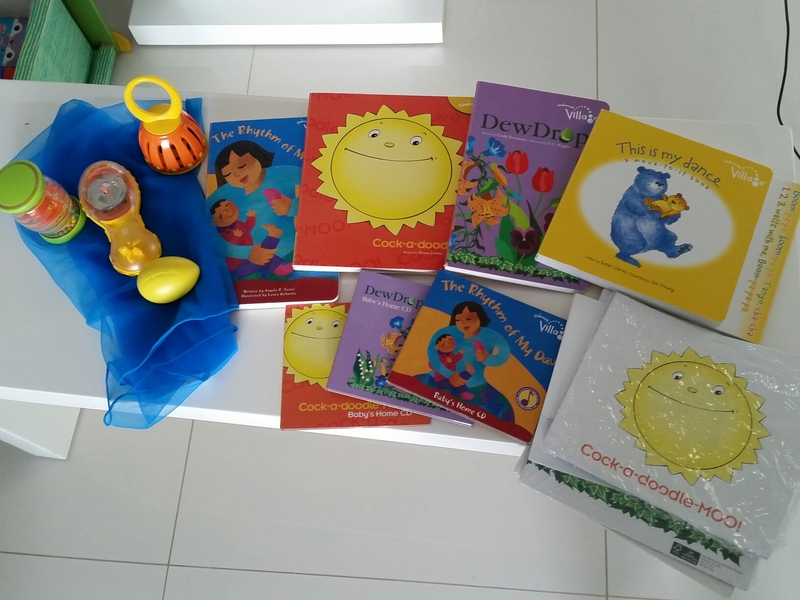 The 45-min programme is filled with a lot of activities aimed to help the little ones develop recognition for rhythms, beats, tunes, fast/slow tempo, loud/soft music. Each term has a different theme. There will always be one or two of the music used for massaging baby in class. There’s also always a “quiet time” halfway through the class, so it teaches baby the signal (song) to wind down and rest a little. 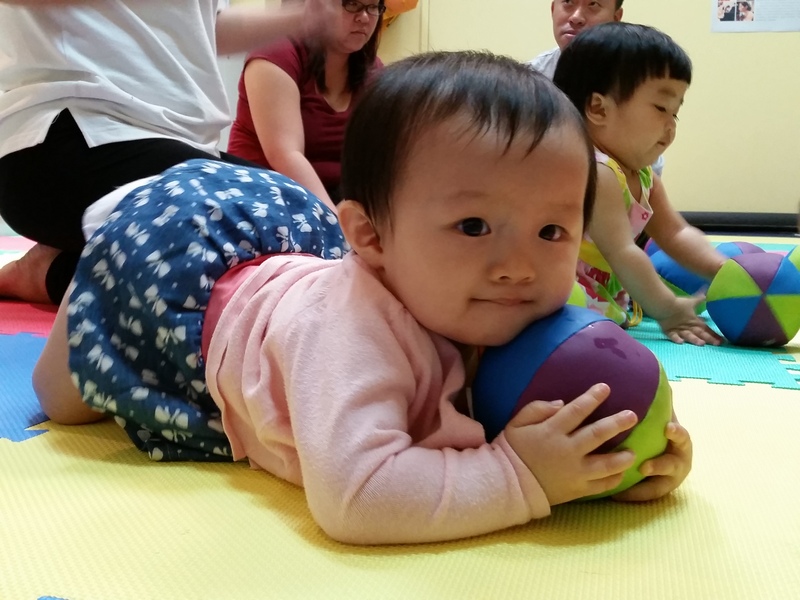 Activities becomes a fun workout (mostly for parents who will be hopping, running, swaying, tiptoeing around the classes while carrying the little one), and other activities to help with baby’s psychomotor skills development. I like that because the classes are not too big, they allow both papa and mama to be in class. This is especially precious bonding time for Papa Long and Little Foot as she sees very little of him on weekdays. Every time new parents turn up with their kids for trial, inevitably, they will turn to us and asked us how it has helped Little Foot. I usually tell them it’s fun time for us, so we keep coming back, but the most important thing was that the music, when we sing and play it at home, she would calm down. I have sang some of the massage songs for her while I rocked her to sleep on trying nights, I have walked up and down the corridor outside my flat humming the songs with her in the carrier during those trying days without help and she would calm down and take a nap. She would always quieten down, pause and listen. As she progressed, she would wave and smile when we sing/playback the songs she recognised. We have spent a lot of times singing “Old Macdonalds had a farm” (from the 2nd term) while I try to drive a screaming baby home in the car without going mad…. obviously the music helped me as much as it did her. So now that we are halfway into the fourth term and already paid for a fifth term, it is timely to write about our experience before it gets hazy in my memories. 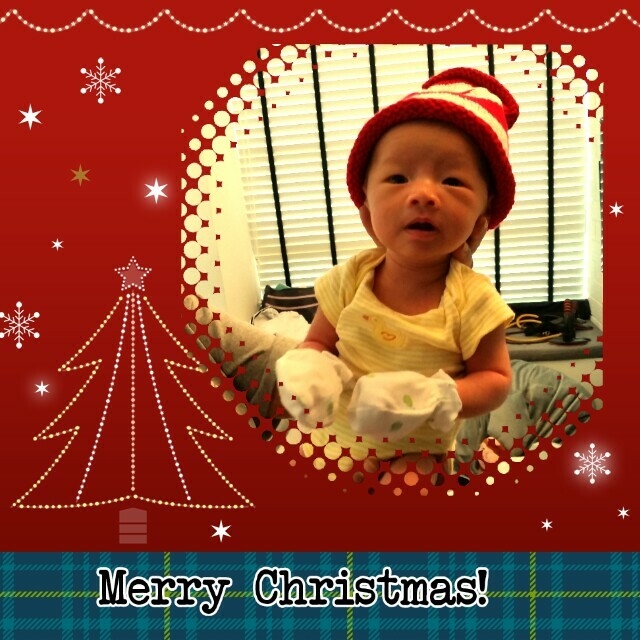 I’m glad that of all the things, we chose a music programme for her. Maybe mummy was trying to fulfill her music dreams through Little Foot, so I tended to lean towards the music programmes. I can’t compare with other programmes since we settled for Musikal Genesis pretty quickly, but I can say is that the teacher, Elize, is very good with babies (having 3 of her own), and you can tell she genuinely loves being around the babies. At the same time, the classes are well-planned so that the 45 minutes is maximised. Every term comes with a kit with a book, a CD, a toy and a set of pin-ups, so you have ample tools to practice at home. So it doesn’t end after 45-mins. With me at home, we’ve definitely maximised these. I think this has been money well-spent, and I think Daddy would agree too. One day, we will outgrow the Kindermusik Village classes just like how some of her classmates have, but for now, we are still happy to carry her to the class each week. 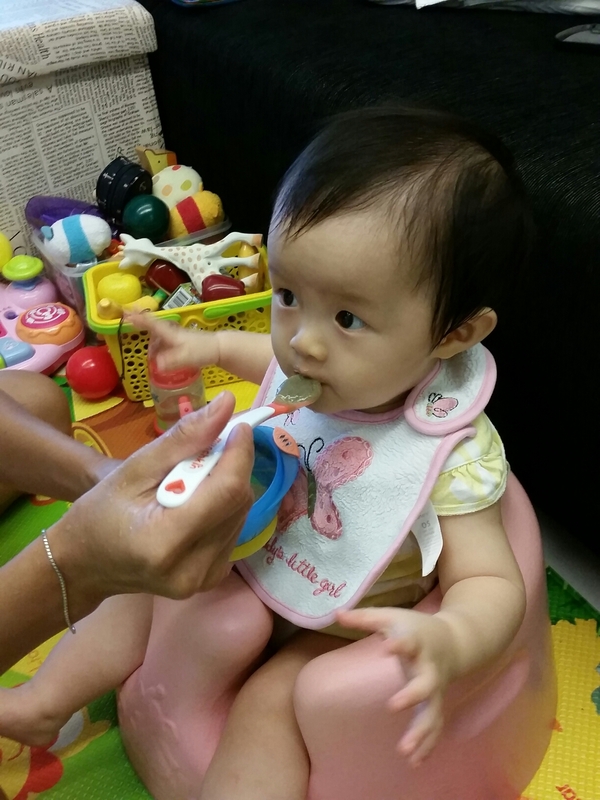 This weekend onwards, the class will be shifting to a Saturday slot, I hope it means she will meet more baby friends! Little Foot is growing so fast, some days it does feel like I’m catching my breath just catching up with her. This month she grew her first tooth, and a second is popping out anytime. She’s also figured out that the walker doesn’t restrain her… it liberates her. So much so, she can run screaming into the kitchen or do a 3 – point turn and go back down our narrow hallway. This means she’s frowning when we place her in the exersaucer, her once upon a time most exciting toy. We’ve also upgraded her to the Standard size Kinderpack, which means her first and most loved KP is going to be redundant soon. In the infant size Kinderpack at 3 months young. Nicely fitting a standard size Kinderpack now. 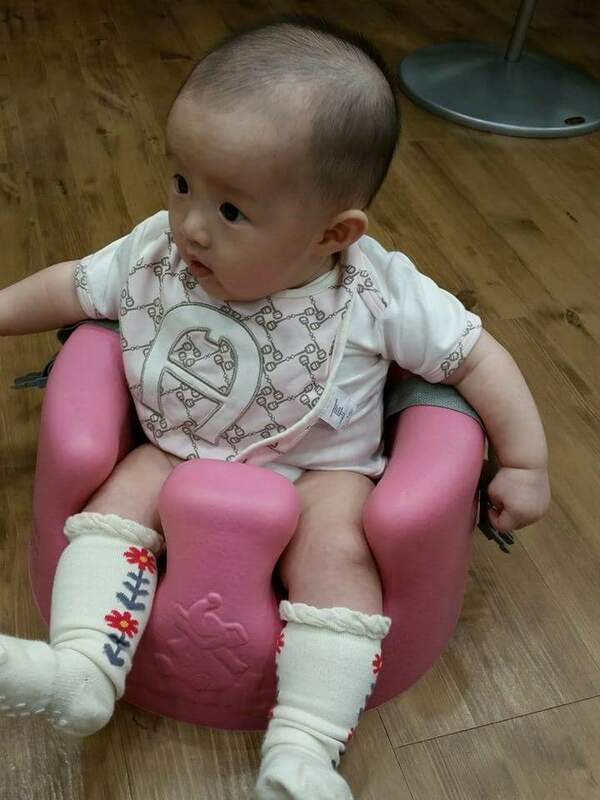 Over the weekend, we got her a proper baby chair and a bigger carseat too. So it’s goodbye maxi cosi and Bumbo. Chubby Little Foot during her first try of the Bumbo. 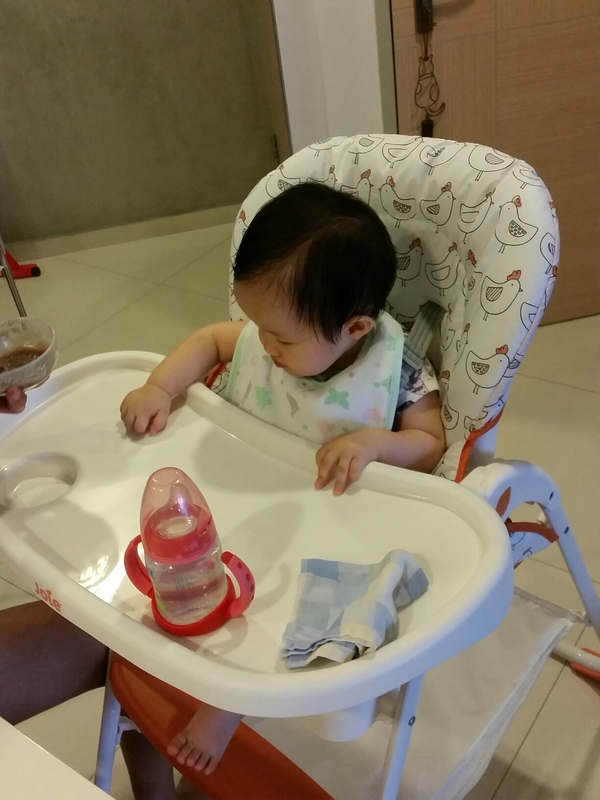 Ready for meals now in her high chair. Mummy doesn’t want time to zip by. I’ve kept so many momentos of her since birth. …from the first romper booties and mittens to her first shoes…even milk bottles. Even the first lock of hair I snipped. Now as she starts outgrowing her toys and baby gear, I’m so torn. I feel this great sense of sorrow as I put her in the exersaucer and wonder if it would be her last ride in it. I don’t want to dismantle the toy… I want Little Foot to be that same excited baby with the gummy smile playing in it. At most, the hoarder in me wants to stash it in the storeroom, not sell it on Carousell. As she progresses along the milestone charts, no one feels more accomplished than me, having stayed at home to journey this far together with her. Yet whenever it is time to wave goodbye to an old toy or clothes she has outgrown, I find myself an emotional wreck. I want to hold on to all these… the things and the precious precious memories they carry, but we know space is a luxury in our tiny flat. 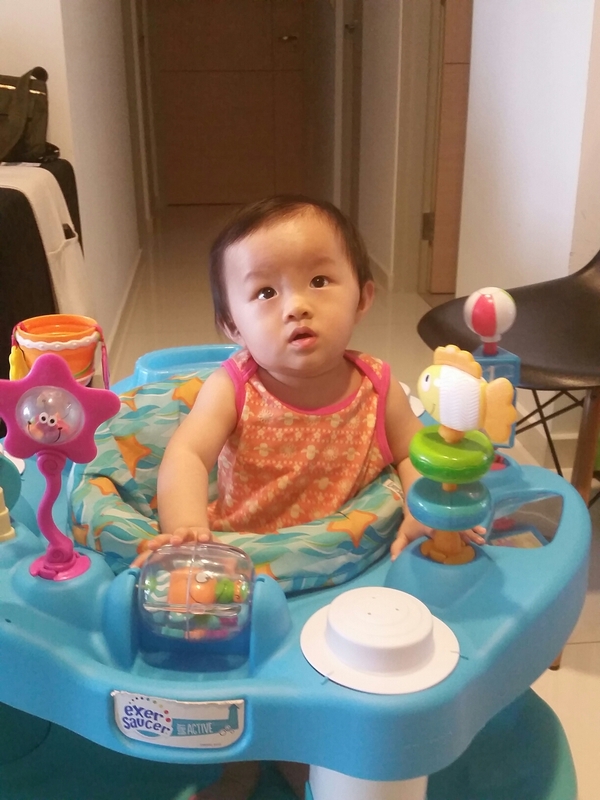 Still remember the first time she sat in the exersaucer, we had to add pillows to make sure she wasn’t floundering in it. Now, from botak head to a head full of hair. Zippin’ up and down in the baby walker. Coming one full circle… happiness! I’m elated. Over the moon. Super happy can die. Just minutes ago, I FINALLY scored a Kinderpack. Yes, retail price. First time ever. 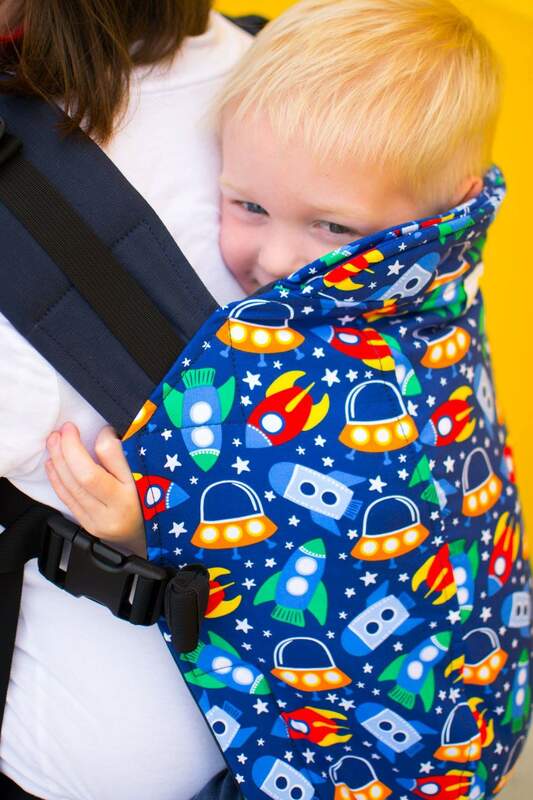 Half a year ago, I first chanced upon reviews of how good Kinderpacks were as a baby carrier, and I tried (and obviously failed) my luck getting one when they released them on their website for sale (in babywearing world, we call it stocking day). Then, I was trying for this exact print called “Rockin Rockets” with Koolnit. Obviously, back then, I wasn’t quite aware how hard it was to get a KP. 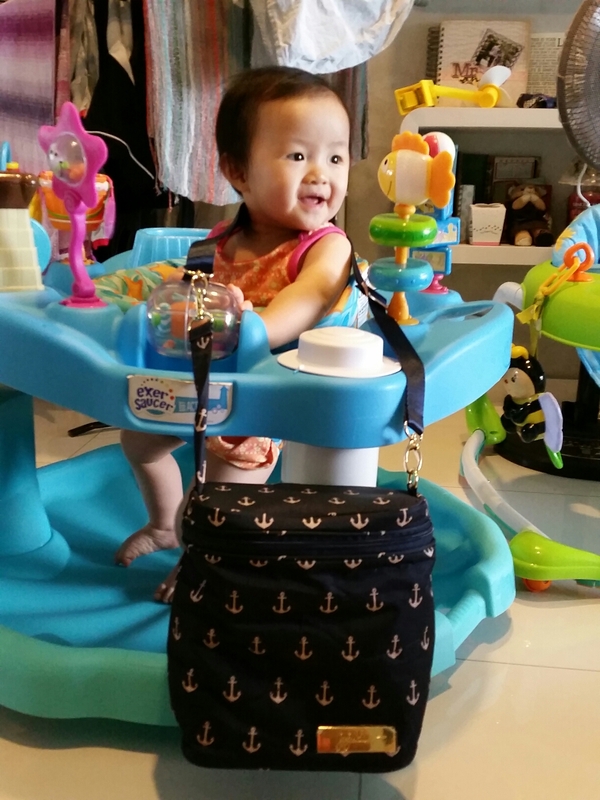 Unlike other brands of Soft structured carriers like Tulas, Lenny Lamb, Manduca, Boba, Kokadi etc, there is virtually no retailers selling them. So disappointed that I failed, I hopped over to Tula website and bought us a Rockets Tula. And I later went on to snag our first (and subsequent) Kinderpacks at market value on the Kinderpack Chatter and B/S/T Facebook group. 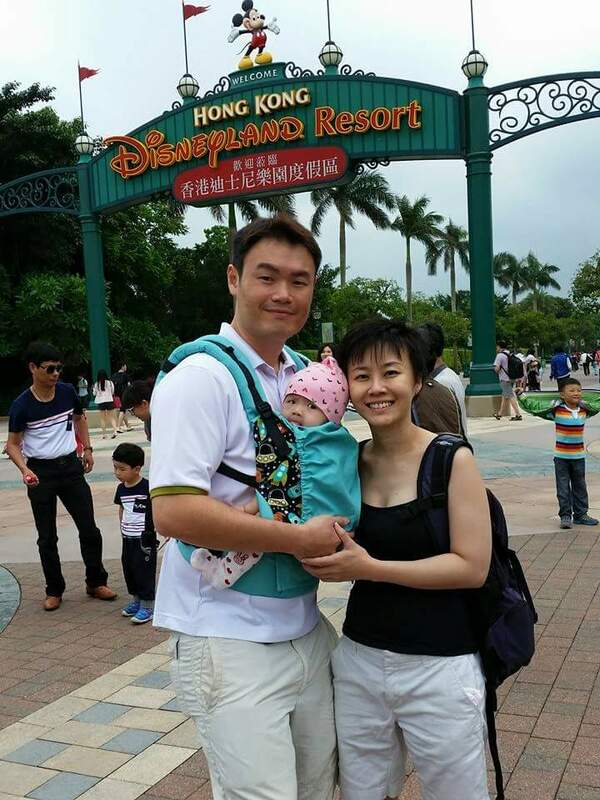 Using the Rockets Tula on our first family trip with baby to Hong Kong. So they released Rockin Rockets again tonight. And I literally sprinted on my keyboard and mouse all the way to payment and checkout page. I guess we have come one full circle. One more item on my to-do list checked. Little Foot, mummy’s got you another rockets! Still can’t quite believe I scored! P.S. 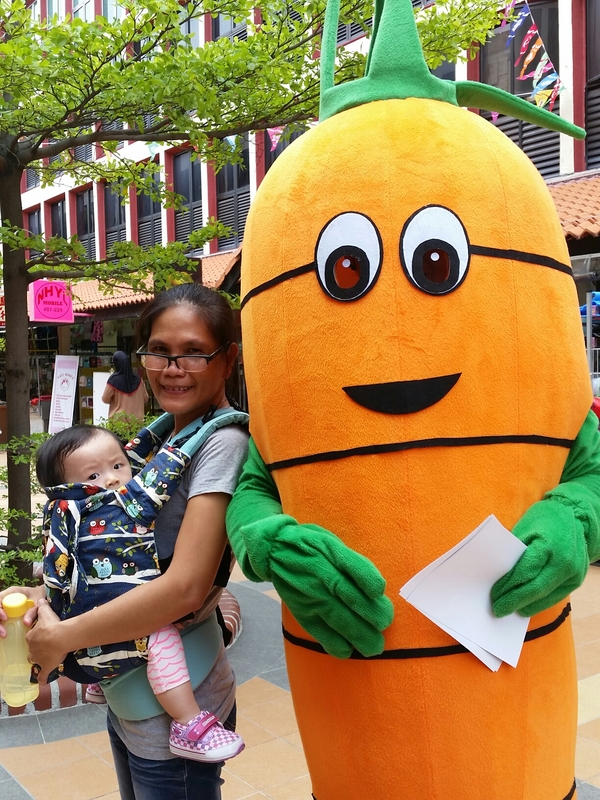 For all who are keen on Kinderpacks, stocking days are Thursdays 12 Noon CDT at Kindercarry website, which translates to Fridays, 1am Singapore time. P.P.S. Little Foot is a huge fan of both the Kinderpack and Tula. Our Rockets Tula is still Little Foot’s favourite Tula, and she still leans towards the Mixed Tapes KP, our very first KP whenever she wants to be carried. Yep… Little Foot is 10 Months young today. 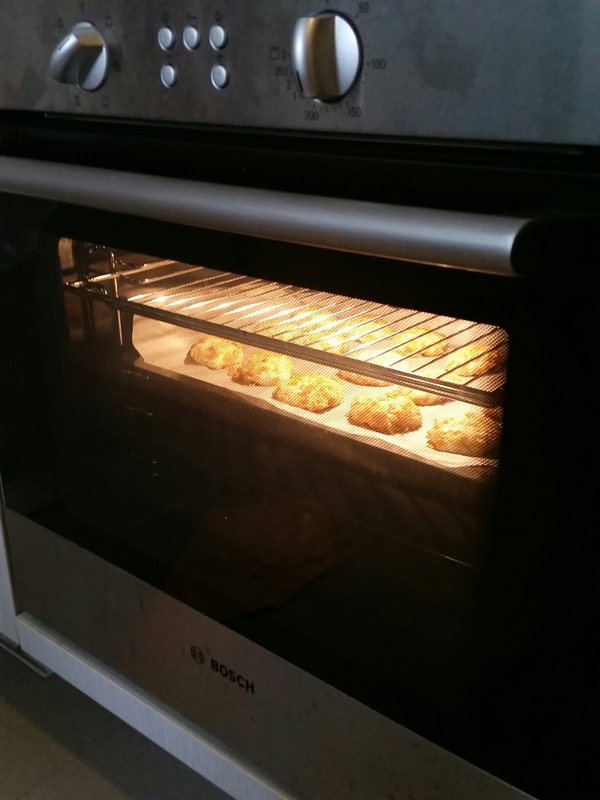 Time ah time…. why did you just fleet by? 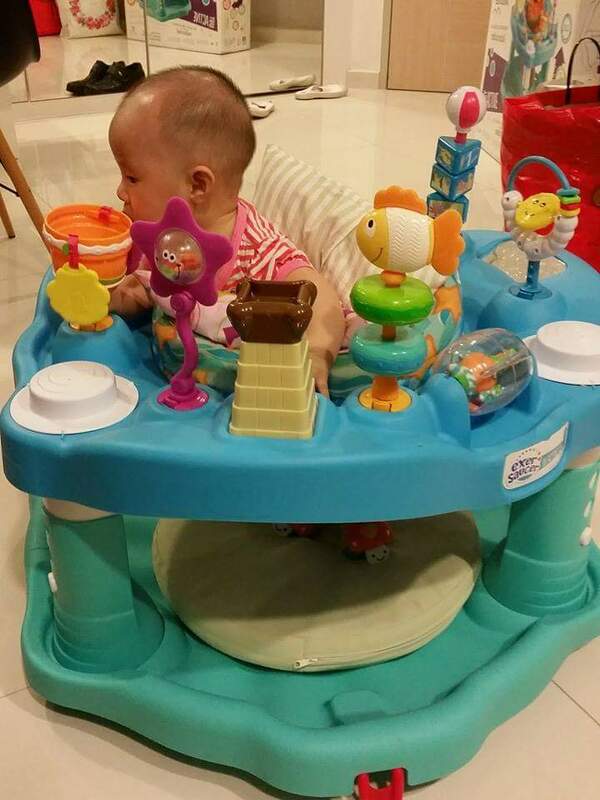 Life has become busier with her becoming more mobile. She’s now a good crawler, mastering tummy off ground just a couple of days ago. And always testing waters… going to the edge of the bed, crawling beyond the playmat to the dining area. She’s also been pulling herself up to stand, and finally figured out how to manoeuvre the baby walker, steering right into the kitchen after us! And finally there is a distinct bump of a tooth trying hard to cut through her gums. Gummy smile will soon be no more… I will miss it, but at 10 months, it’s about time some teeth showed! 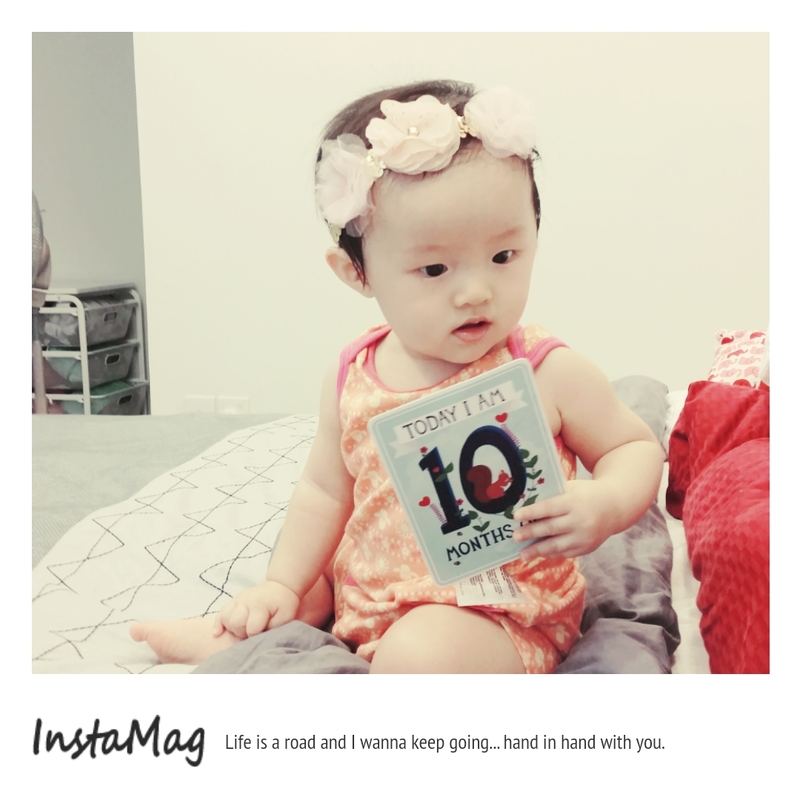 Thank you for 10 months of love my Little Foot… I know you love me even when you are pulling my hair really hard. Oh man…time flies and the 1st birthday is approaching! Time to stop slacking and start the preparations! And we have 1 month left to figure out how to settle your milk affairs without latching. 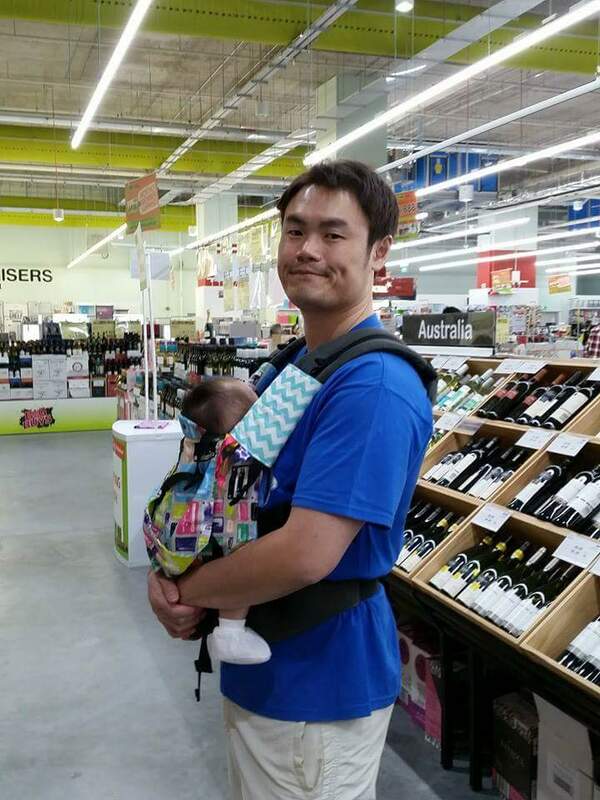 Please take to the bottle (and formula milk) soon! Gotta blog this moment that took place tonight! People always talk about how babies are like sponges and they learn soooo fast. Ok, really no kidding. Tonight, Little Foot gave me a taste of my own medicine. We’ve been making fart sounds on her tummy, back and neck to make her giggle since she was a small little bundle. She gave it all back to me tonight. Tonight, while trying to make her sleep (latching), she decided to worm around the bed and flip here and there. The next thing I knew, she started sucking on my tummy. Tickled me so bad, I squirmed, wriggled and laughed, and the little cheeky rascal found it so funny she giggled really hard and laughed out loud! This went on for about 5 to 10 minutes. Mummy and baby kept laughing and giggling. 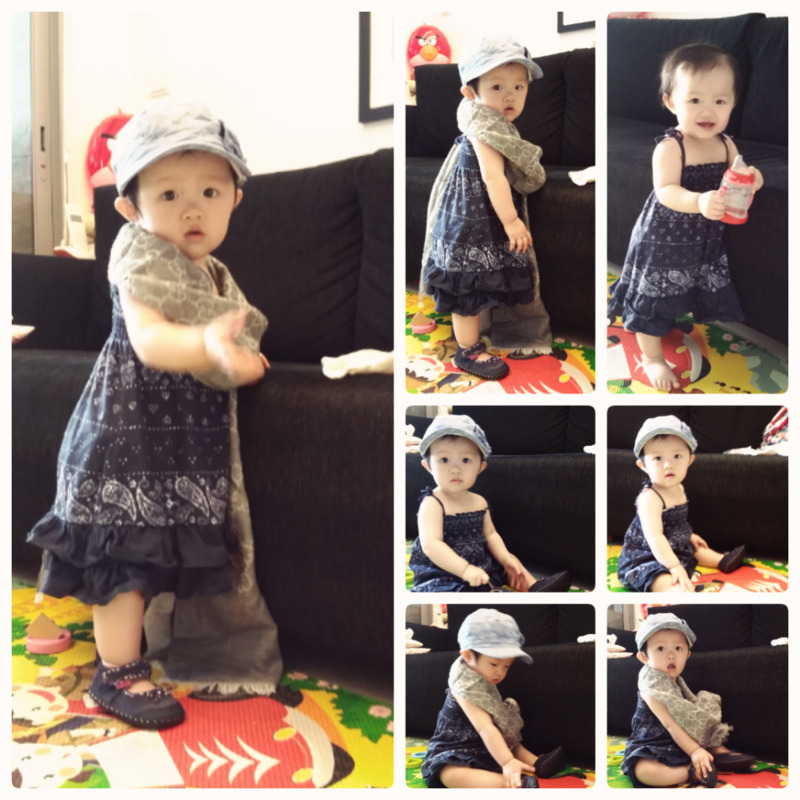 She kept pouncing on me and make “zhuut zhuut” sounds on my tummy… I laughed and wriggled, she laughed and giggled too. Funny how this little one gets tickled by the strangest things –previously she laughed whenever I pretended to vomit/spew blood or choke. I lost patience a couple of times this week, especially that day when she clawed my face and broke skin, and yesterday, when I couldn’t order dinner after 1 hour of trying while struggling with a wormy whiny Little Foot. I was tired. I wanted to lie down and rest too, but rest is not granted if you are the mummy. So, to see her laugh so happily tonight is really a relief and a nice change of mood. I really loved and enjoyed that happy moment between us…. definitely a fond memory to keep! Keep calm and giggle on baby, life is too short to keep frowning, whining and crying.